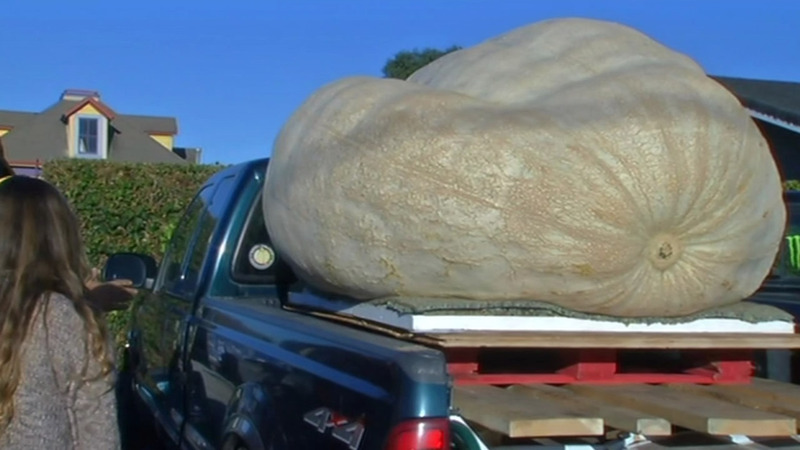 The annual Half Moon Bay Pumpkin Weigh-Off set a North American record! HALF MOON BAY, Calif. (KGO) -- You know we're close to Halloween when you start hearing about the giant pumpkins in Half Moon Bay. The annual weigh-off of the gigantic gourds kicks off the Half Moon Bay Art and Pumpkin Festival. For the past several months, contestants have watered, pruned, and primed their giant pumpkins to perfection. "I spent hours on my plants, I gave up a lot of weekends where my wife wanted to go someplace and I wouldn't go. I took some time off work because it was so much work this year with the hot weather," said John Hawkley, who won this year's competition. Hawkley will get a check for $12,348, that's $6 per pound, for his pumpkin that weighed-in at 2,058 pounds - a North American record. The pumpkins can pack on up to 50 pounds per day, but the water weight disappears almost as quickly. "You're losing water the very second you cut it," explained Hawkley. That's why most growers kept the vines submerged until weigh-in. But winning isn't everything says Rob Globus. "I do it for the camaraderie. I like hanging out with people. I'm very competitive and I like to have bragging rights," he said. Bev Ashcraft started the event 44 years ago. She says pumpkins mean a lot to Half Moon Bay. "They've brought a lot of people to Half Moon Bay, put us on the capitols of the world." The pumpkin weigh-off kicks off a week of events culminating in this weekend's Half Moon Bay Art and Pumpkin Festival. The event includes the Great Pumpkin Parade, pie-eating and costume contests, pumpkin carving and a host of pumpkin-inspired food and drinks. The five heftiest pumpkin contenders will be on display through the weekend.